Protests against the economic reconciliation bill. Chedly Ben Ibrahim/Demotix. All rights reserved. Tunisia’s January 2014 constitution clearly anchors sovereignty in democracy: the people exercises sovereign authority over its representatives, and the state makes sovereign decisions about its place in the international community. But the new constitution hasn’t quite succeeded in establishing such a democratic sovereign. It’s as if the 2014 elections sealed people’s agency, as if the democratic process was conveniently frozen at the point when it best suited old hands. Today, when the people take to the streets to call for their political or economic rights, the government responds with patronising speech, and the police with violence. The destiny of the country now seems to depend largely on negotiations between an international oligarchy and the national plutocracy. A recent Washington Post op-ed shows this dynamic at work. The “partnership” between Tunisia and the U.S. proposed by the authors relies exclusively on high-level dialogue and top-down directives. One of the authors chairs the US-funded Tunisian American Enterprise Fund (TAEF), which manages the very investment money that he argues should be increased. Never mind that a US Government Accountability Office report found TAEF lacked “vetting requirements designed to prevent illicit use of the fund”—it appears that popular sovereignty is just a nuisance when business is at stake. Rather than a partnership between peoples, supposedly well-intentioned international actors are merely proposing a new way of linking business elites across national boundaries. With its economy hurting, there is a real temptation for Tunisia to sacrifice some independence in the hopes of short-term solutions. But building bridges over the Tunisian street is a recipe for disaster. The demands of the 2011 uprising for dignity and freedom cannot be consolidated without a certain affirmation of sovereignty. Tunisia’s democratic sovereignty faces four major obstacles. The first is a new war on terrorism. Offering minimal strategic vision and using dubious tactics, security forces armed with new American weaponry have so far conducted this war in a way that tramples liberties. At the same time, the government has fallen back into the habit of criminalising poverty and political dissent. But the risk of linking Tunisia’s have-nots with terrorism, even rhetorically, is that it becomes a self-fulfilling prophecy. Building bridges over the Tunisian street is a recipe for disaster. The second is the muffling of public input in the negotiations over how Tunisia will seek the help of international finance institutions (IFIs). In the absence of an inclusive debate, Tunisia will replicate the mistakes of the past, whereby a corrupt oligarchy, that represents only its interests, will condemn future generations to repaying an unrealistic debt. The third is Tunisia’s new geostrategic value. The country now appears a stable and coveted base from which to launch anti-terrorist operations. While this could be a blessing if managed properly, the risk of a military relationship shrouded in secrecy, with no clear definition of an enemy or a long-term strategy, risks reshaping domestic Tunisian politics from above. 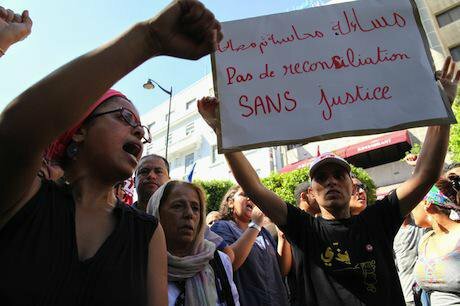 The fourth is that Tunisian voices are still not leading the debate about its place in the world. Tunisian scholars, experts and activists should play a much more active and vocal role in the production of knowledge about the revolution and the democratic transition. The current division of labour between international experts who import models and narratives, and local researchers who serve as providers of data, translation and contacts reproduces anachronistic hierarchies inherited from the colonial past. Tunisia has numerous assets that have kept its struggle for a sovereign democracy alive. These include a vigilant and educated civil society, a resilient and imaginative rural population, and a geographical location that promises the option for the state to diversify and enrich its relations with Sub-Saharan Africa or Asia. These important resources, however, cannot develop in the current context in which the people’s capacity for self-determination has been provisionally and conveniently frozen by the 2014 vote. The bill for a “reconciliation” law that would grant pardon without judgment to corrupt businessmen and politicians clearly illustrates how the search for deliberative compromise has been replaced by a coerced consensus. The governing coalition often invokes “haibat al-dawla”, or the “prestige of the state,” but the phrase has turned into a grotesque excuse to asphyxiate social movements, crush political dissent, and coerce the Tunisian people to grant nearly unconditional amnesty to the cronies responsible for the country’s economic quandary. It has not led to the formation of a sovereign democracy that seeks, internationally, to asserts its right to a political and economic model best suited to its own needs and capacities and that fights to develop public and private liberties.